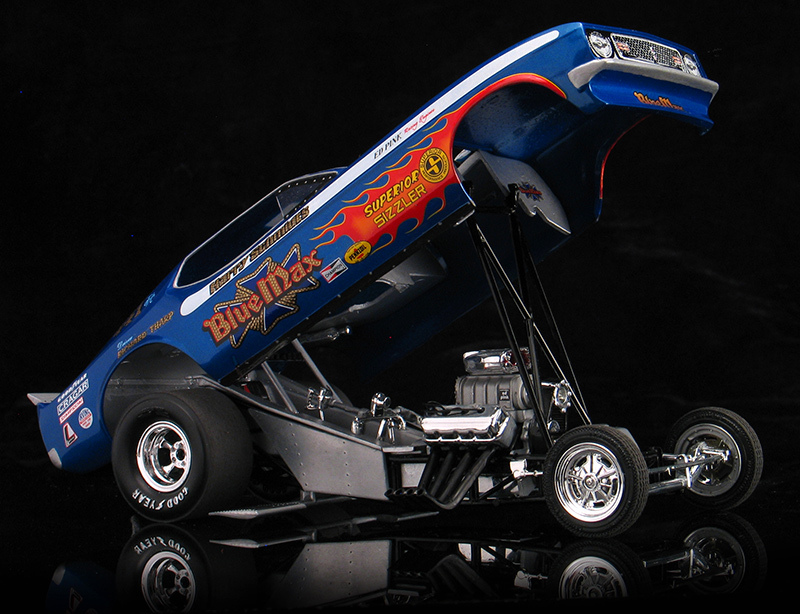 One of my all time favorite funny cars teams is the Blue Max drag racing team. 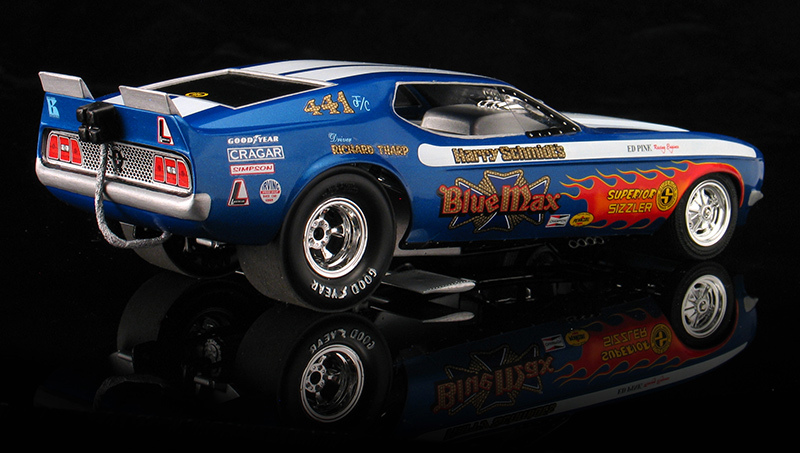 The Blue Max Team, founded by Harry Schmidt, ran a series of funny cars (mostly Ford Mustang bodied) in the '70s and '80s. In 1975, Raymond Beadle bought into the team and helped take it to the next level. I've always thought it would be cool to build a series of replicas of this team's cars funny cars. 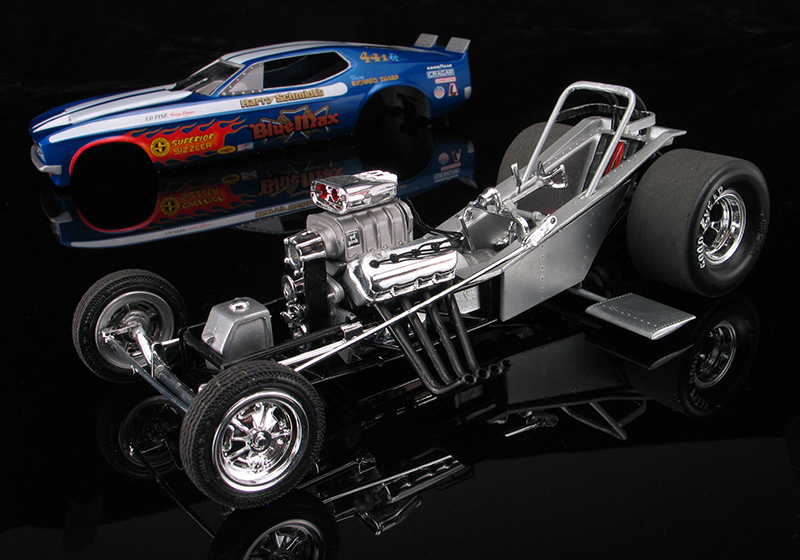 The first one I've finished is the 1972 version driven by Richard Tharp. 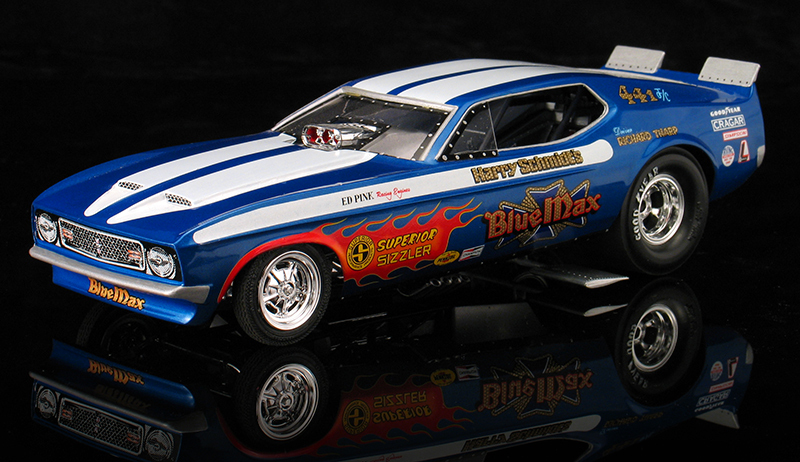 I built this replica using the Model King re-issue of the original MPC Ford Mustang funny car kit . After collecting research photographs on the web it appeared to me that the basic kit was close to being accurate for the Blue Max but I thought I could improve on it in a few ways. First, I replaced the kit decals (which represents the late season '73 Mustang I think) with a new set of Blue Max decals I ordered from Slixx. Slixx makes excellent sets for many of the Blue Max cars. 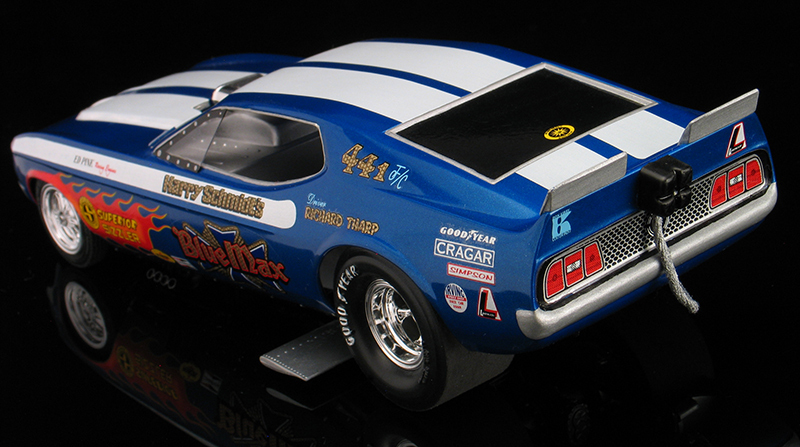 This set had the options for the '71 through '73 Blue Max Ford Mustangs. 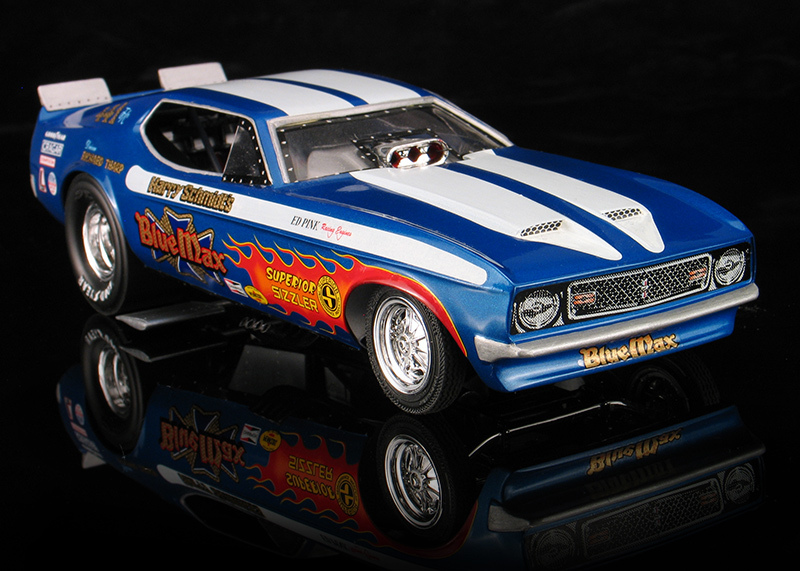 After studying reference photos I decided I liked the paint scheme of the '72 version Blue Max Mustang best and decided to build this one. The Slixx decals fit the old MPC Mustang body pretty well but I did have to modify the flames around the front wheel well by cuting them into two pieces to get them to line up correctly with the opening. Later after they were dry, I touched up the flames with a little Testors red brush paint which matched the color perfectly. The paint is Tamiya metallic blue shot from the can. It came very smooth and glossy and after I applied the decals I waxed the Mustang's body to finish it off. With the Mustang's body finished I set about building the chassis and engine. 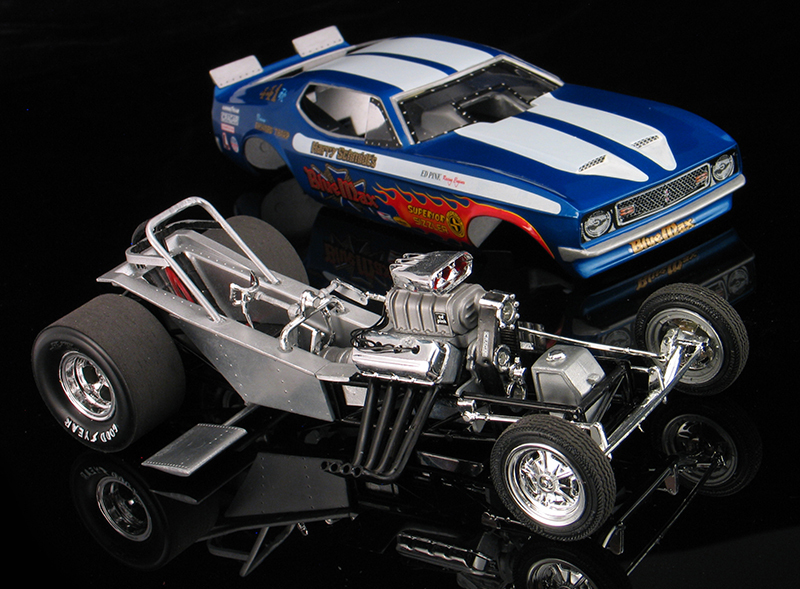 I thought the kit supplied front axle looked too narrow compared with my reference pics so I replaced it with a wider unit from the Model King re-issue of the MPC Dodge Challenger funny car. That kit uses the same chassis so it's an easy swap. Assembly of the rest of the chassis went pretty straight forward but during final assembly I found a lot of fit interference issues with the interior tin. If I had left the problem alone the body would have set up too high and not given the car the proper stance. That really bugs me when cars don't sit right. So I ended up having to do a lot of grinding on painted parts and the interior tin to make everything fit properly. Not my favorite thing to do. I'm usually pretty good about test fitting everything before painting but these funny cars chassis are kind of fussy to put together. I still always seem to end up modifying something in the end to get it all to fit right. Normally, I don't like building engines and doing wiring work, but a blown Hemi engine really doesn't look right to me without at least some plug wires, so I made a humble attempt at it and added them. Other details I added included quarter side windows made from sheet acetate and lines for the parachute. 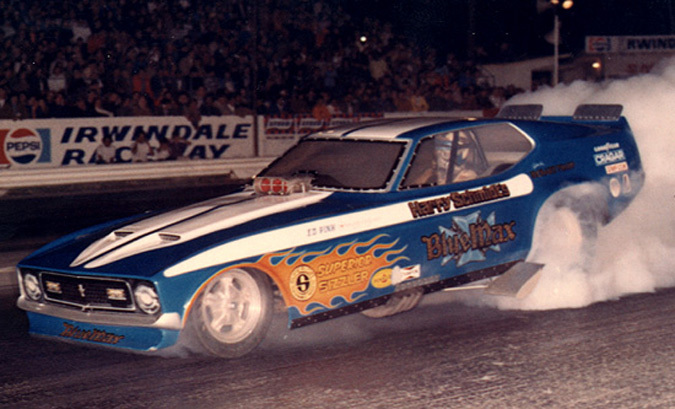 The bottom picture is an actual photo of the real Blue Max Mustang funny car rom 1972.